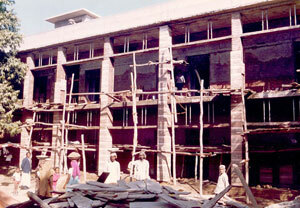 St. Clare’s School, was established in 1957 by the Archbishop of Agra late Dr. Dominic Athaide. It was up to class V till 1972 it was upgraded gradually to a High School. In 1987 it was established as a full-fledged High School. The School then had 32 staff member with 1156 student on roll. The built up area was 2851.19 sq. mtrs. with 22 class rooms, 3 well equipped Science Laboratories, Library, a Cultural Hall & an Indoor Badminton Hall. A well-equipped Computer laboratory was added to it infrastructure facilities in 1991. 10 class rooms were more added in 1993. The school was upgraded to Senior Secondary School level in the same year. The school offers the following subjects for studies in the +2 level, English, Hindi, Math, Physics, Chemistry, Biology, Computer Science, Accountancy, Structure of Commerce & Business Studies. Through the years the school has grown in strength & quality. It has 2424 students on its rolls from classes L.K.G to XII. Most of the students hail from middle & lower income group. Every effort is being made to give our students sound education, keeping with the material aspiration & to make the individual spiritually, mentally, physically & socially fit to become active useful citizen of India who will not only bring about social changes but build a better world. St. Clare’s keep say high profile & result both in academics & co-curricular activities. Even with the limited ground facilities our students are regularly selected for the District & State level competitions in Football, Basketball, Badminton & Table Tennis. Our school team wins many prizes in the interschool activities & other competitions conducted by various Organizations & Clubs.